April 1915 Butler Bros. 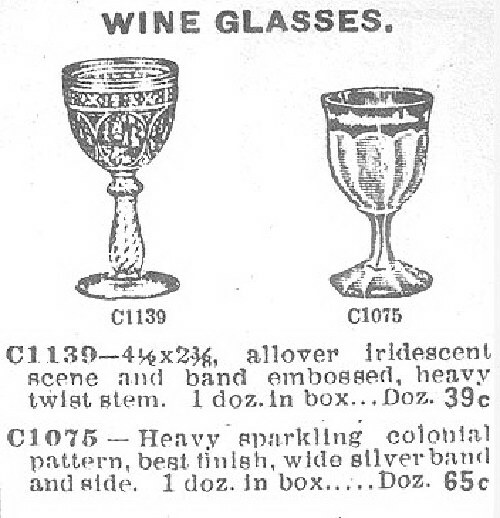 Catalog Ad. 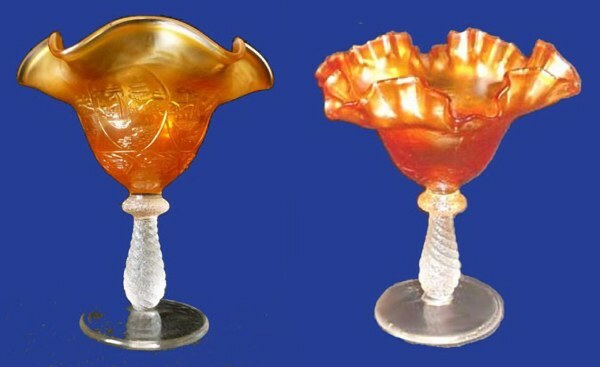 SAILBOATS Compotes flared from Goblet - 6 in. tall, 3 in. diam. base. SAILBOATS Wine in Blue - SAILBOATS Goblet in Marigold. SAILBOATS - Marigold and Amethyst 5.5 inch Sauces. RARE - Green SAILBOATS 5.5 inch Sauce. SAILBOATS: This pattern appeared in 1915 Butler Bros. Wholesale Catalogs, continuing on into 1923. 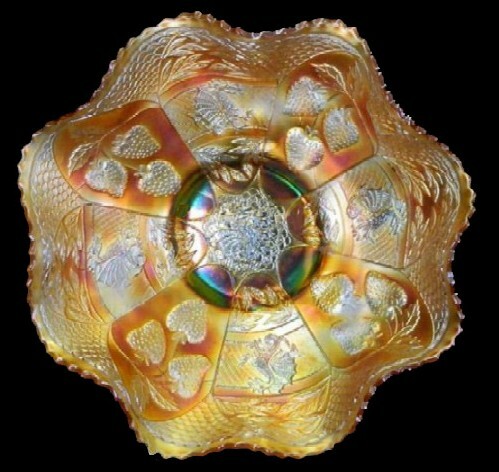 Whether in the wine glass shape, or flared into a compote; some having candy ribbon edge, the design is captivating and apparently the late Frank M. Fenton appreciated the design. 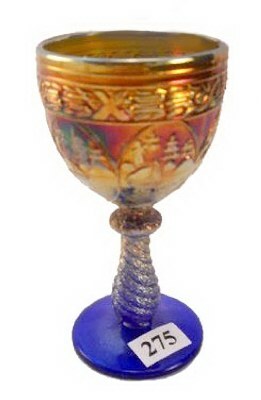 The blue wine glass was included in his “private collection”, sold at auction after his demise. 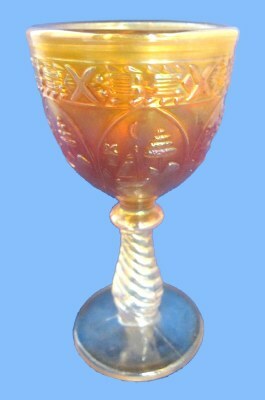 An occasional marigold water goblet can be found. 5-6” sauces are also found in this pattern. Amberina, amethyst, aqua, blue, green, lavender, marigold, red and vaseline are known colors. Occasional 6-6 ½” flat plates in marigold and blue create additional interest in the pattern. 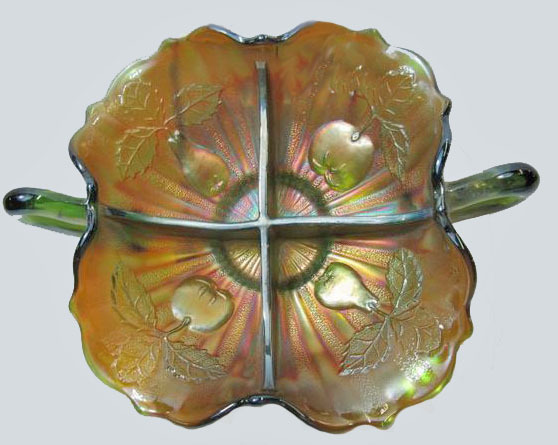 HEARTS & TREES: The first reported ice cream shaped bowl in this pattern was in the collection of Bernie and Nancy May. Their collection was sold at auction along in the early-mid 2000 timeframe. Not long after that, Buddy Beaird sent a photo of his bowl. Early in 2013, Bill Moran presented us with a like-example! Rather than the possibility of three such bowls, we suggest that it could be the same bowl having changed hands?? The May photo can be viewed in Fenton Glass – Part 5. RAGGED ROBIN - 8.5 inch - 3 & 1 edge.- Green. 1912 RAGGED ROBIN in Blue, CRE and 6 Ruffle. RAGGED ROBIN in Amethyst - 8.5 inch. RAGGED ROBIN: Having grown up in WV, where these flowers grow along the highways and in open fields, etc., we have appreciated their gorgeous blue color all our lives. It is no surprise at all that one of the mould designers for Fenton Glass would find its beauty appropriately applied to glassware! Amethyst, blue, green, and marigold examples with the various ruffled, 3/1, and candy ribbon edge treatments are not too easily attained……….at least not in the quantity of Peacocks! (smile). Ragged Robin is seen in a 1910 Butler Bros. Wholesale Catalog ad. For pattern collectors, this is a desirable example! 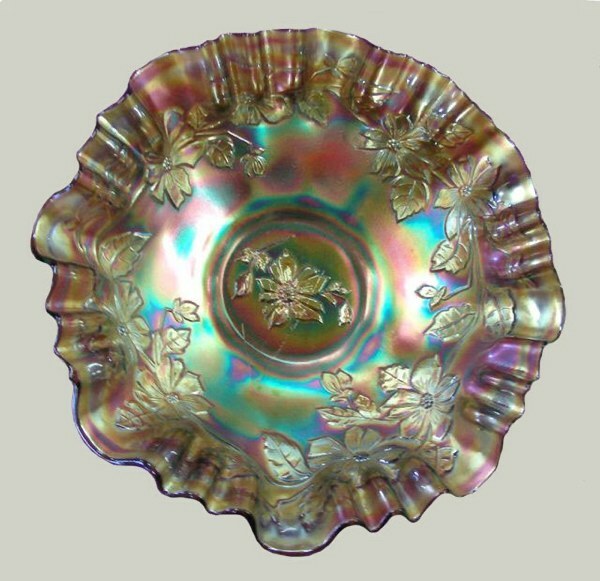 The pattern is only found on 8 ½”-9” bowls! Two Fruits Bonbon in Green. TWO FRUITS Bonbon: Some are ice cream shaped. Basically, it is the Stippled Rays bonbon with the overlay of apples and pears. Blue, green, marigold and vaseline are known colors. Overall, the pattern is not easily obtained. #1695 as the item number, it was produced in the 1912 timeframe. DRAGON and STRAWBERRY - 9 inch Bowl in Marigold. 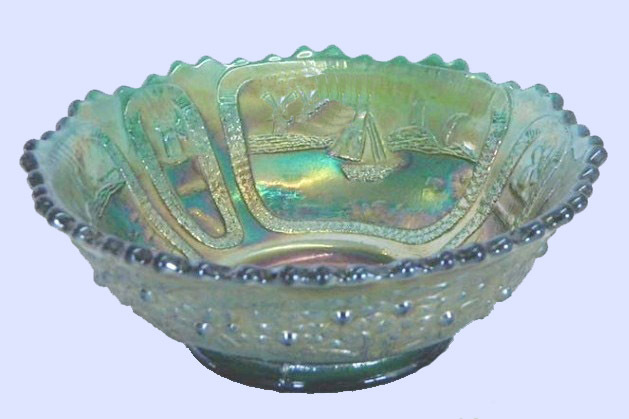 DRAGON & STRAWBERRY Bowl: Much like Dragon and Lotus, this is a pattern having a dual theme, but the limited color range and shapes offered, indicate this to be more scarce. According to Frank M. Fenton, his Father found delight in oriental designs. 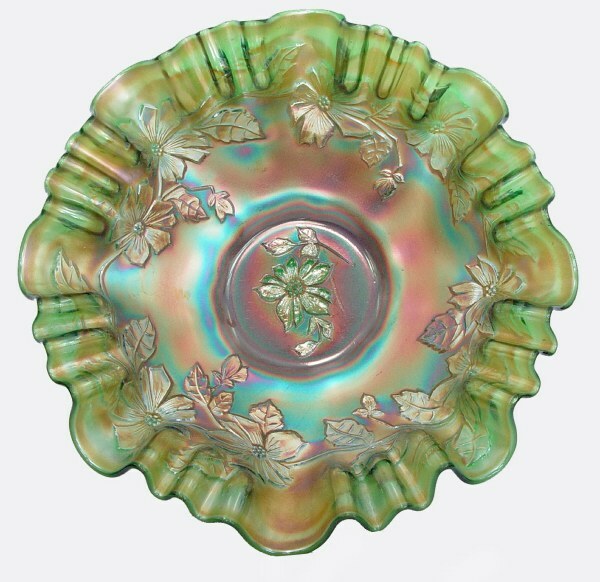 There are collar-based, as well as spatula-footed bowls in this pattern, along with a few plates named “Absentee Dragon and Berry”. There is no dragon in the pattern! Unto the upright there arises light in the darkness; He is gracious, and full of compassion, and righteous. A good man deals graciously and lends; he will guide his affairs with discretion. Surely he will never be shaken; the righteous will be in everlasting remembrance. He will not be afraid of evil tidings; his heart is steadfast, trusting in the Lord. His heart is established; he will not be afraid, until he sees his desire upon his enemies. “There is no title to this psalm, but it is evidently a companion to the 111th, and, like it, it is an alphabetical psalm. The number of verses and clauses of each verse coincides with its predecessor, as also in many of its words and phrases.